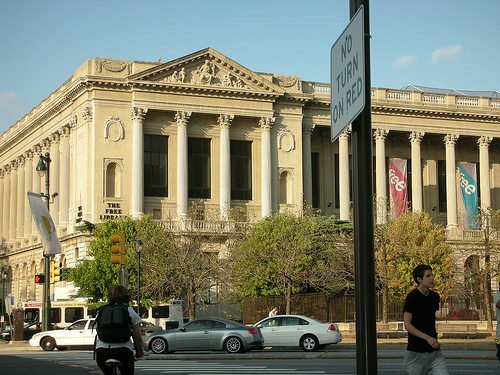 The Free Library of Philadelphia - on Benjamin Franklin Parkway. Editor: San Diego, of course, was not the only city fighting library closures due to budget cuts in these economic hard times. Activists in Philadelphia made important victories in keeping theirs open, at least temporarily. As in San Diego, a mini-movement developed around the saving of the libraries. It sounds like, however, Philly activists are a couple steps ahead of their San Diegan cohorts. Yet, in both Philly and San Diego, activists considered non-violently occupying libraries slated for closure. PHILADELPHIA–Activists have won another victory against the slated budget cuts here. On December 30, the day before 11 neighborhood libraries were set to be closed, Judge Idee Fox issued an injunction, halting the closures. She ruled that Mayor Michael Nutter needs a vote from the City Council in order to shutter the libraries. Now, the mayor must win an appeal or get support from the City Council, which has already called for a six-month delay on any library closures. Nutter has proposed $1 billion in cuts in the next five years, much of which will come out of social services. Initial cuts included permanently closing 11 of the city’s 53 libraries, cutting seven fire companies, 68 public pools, leaf and trash pickup, and snow plowing. Many of these services are being cut in the poorest neighborhoods in Philadelphia. People outraged with the closures organized protests at threatened neighborhood libraries across the city, often drawing hundreds. The mayor was forced to organize eight town-hall meetings to defend his extremely unpopular cuts. Hundreds came out to each meeting to challenge the mayor and recommend alternatives. One suggestion was to rescind the city’s generous tax abatement program, which has lined the pockets of developers. In neighborhoods that saw the most resistance to cuts, protesters held signs and regularly interrupted the meetings with booing and chants. Activists filled the courtroom for the two-day hearing on an injunction to keep the libraries open, an important factor in our victory. The fight is far from over, however. The mayor is pursuing an appeal, scheduled to begin February 25. He has gone on the offensive, blaming the decision and library activists for obstructing his plans to reopen closed branches as privatized “knowledge centers,” which will leave many library services missing. He is also instituting unnecessary rolling closures of libraries in order to punish library patrons and divide neighborhoods against each other. Could this scene in the movie, PHILADELPHIA (1993), been made if the library was closed? 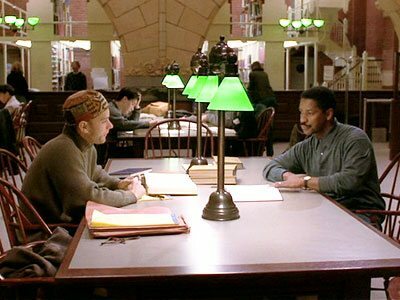 In one of the many heart-breaking scenes from Philadelphia, Tom Hanks’ character Andrew Beckett endures the suspicious and fearful stares of other library patrons and the librarian who helps find a book about AIDS discrimination. Witnessing the struggle, Joe Miller (Denzel Washington), who had previously declined to take Beckett’s case, agrees to the job. The mayor has promised more budget cuts in addition to those already imposed on the Fire, Sanitation and Recreation Departments. In the coming days, activists will have to decide whether to broaden the fight to take on other cuts of our needed social services. Despite Nutter’s attempt to demoralize activists and divide the city, activists have only gained confidence. The Coalition to Save the Libraries is organizing regular “People’s Court” hearings to help combat Nutter’s PR offensive. This exciting movement in Philadelphia is the kind of thing that can help boost the struggle against budget cuts nationwide. This was on top of the town hall meetings that the mayor has been forced to set up in various communities for him and his staff to explain these cuts. On the chopping block are 11 libraries, public pools, fire services and more. Through protest and attendance at city hall meetings, we’ve been able to collectively put enough pressure on council members to vote the right way, and this should be motivation to keep doing the work we’re doing. I’ve been directly involved with the organizing around the Kingsessing library closing in Southwest Philly. There have been different demands within the citywide protests, but the strongest have come from Southwest Philly, and they should offer an example of how to organize and what demands to put forward. We should demand that all the branches stay open for their full hours (whereas some groups and leaders have tried to set forth compromises from the start). With the economy getting worse and future budget cuts on the way, now is the time to stand firm and demand what is rightfully ours. They can find their budget money from the millions in tax abatements given away by the city, from the corporations that owe the city, or by taxing the rich (as was chanted at the mayor at the recent town hall meeting at the Kingsessing Recreation Center: “Tax the rich! Tax the rich!”). What we’re learning as a group of organizers is very important. There’s enough militancy that if we don’t get what we want by the slated closing time, we should think about physically occupying the building in protest. We can take inspiration from our brothers and sisters in Chicago who occupied the Republic Windows & Doors factory and won. An occupation and sit-in in the Kingsessing library would show them just how serious we are about not letting our libraries go, and would make them think twice the next time social services are on the chopping block (which will be very soon). Either way, the struggle is far from over. We need to set our minds on the future, and I look forward to organizing more and learning with my brothers and sisters in Southwest Philly and all over the city. The mixture I see of love for the community and anger at the government’s lack of proper leadership is the birthplace of revolutionary consciousness.